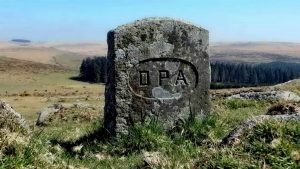 The DPA owns four pieces of land on Dartmoor. All were bought to preserve their special qualities. There are two areas of open moor (Sharpitor and Swincombe), one enclosed area of moorland and woodland (High House Waste) and one enclosed area of hay meadows (Pudsham). Description: The land is bordered by streams on the east and west – Broadall Lake and the Ford Brook. High House Waste is within both the South Dartmoor and Dendles Wood Sites of Special Scientific Interest. Most of the site is grass moor or heath; there is an area of upland oakwood and two areas of valley mire on the east-facing slope. There is a ten-year management plan and a grazing tenant. There are two Scheduled Ancient Monuments. The northern newtake wall follows the line of a Bronze Age reave. There is a prehistoric settlement in the north-east corner and remains of a possibly medieval farmstead with approach tracks in the centre of the site. Although we have seen Dartford Warblers here in the past few years, there have been no recent sightings. The species has extended its range greatly in recent years and the pairs that are appearing in gorse habitat on Dartmoor are just part of this extension. Location: on the south-west of the moor, near Cornwood. Grid reference SX610625. Area 57 hectares (142 acres). Access: There are gates in both the north and west walls, as well as into the woodland to the east. 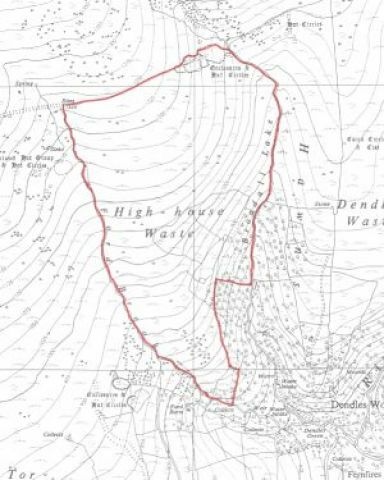 In 1959 High House Waste, and Dendles Moor to the east, were acquired by a forestry company with plans for planting conifers. Forestry was not under planning control at that time and despite a campaign against afforestation, planting on Dendles Moor commenced in 1960 and the only way to save HHM was by purchase. The DPA was against conifer planting because it would spoil the prehistoric and historic sites, reduce the amenity value for access and enjoyment (including the magnificent views over south Devon) and destroy the wildlife. In 1964 HHM was bought by an individual on behalf of the DPA. The DPA launched an appeal for money to purchase the site in July 1964, which reached its target and was closed in late 1965. When it became DPA property it was with a view to offering it ‘to the National Trust or some similar body or to be vested in trustees’. A deed of trust was set up in 1969 with three trustees. In 1980 discussions took place about the disposal of the land to a more appropriate body, or the DPA becoming a corporate body and therefore having corporate liability. At the 1983 AGM, HHM was transferred from the High House Moor Trust to four trustees of the DPA. In 1993 again the decision was made not to lease or sell HHM to another body. High House Moor is on the southern slopes of Dartmoor, centred on grid reference SX610625, 2-3km north of Cornwood village. It occupies about 57 hectares (c142 acres). The adjacent land is common grazing to the north and west, enclosed farmland to the south, and woodland and ex-conifer plantation owned by the Dartmoor National Park Authority to the east. The site rises from 200m (700?) above sea level in the south to 370m (1250?) in the north. It is bordered by two streams, Ford Brook to the west and Broadall Lake to the east, both tributaries of the R Yealm. The whole site is underlain by granite, apart from alluvial deposits associated with the streams. For a copy of our 8 page booklet all about High House Waste, the restoration work we do there and the history and ecology of the site please click here. You can download a copy of our management plan for this area by clicking here. Location: South east of Princetown, near the junction of the Rivers Swincombe and Brake, north-east of Fox Tor Mire and north of Childe’s Tomb. Grid reference SX 624711. Area 19.35 ha (50 acres). Description: The land is unfenced open moorland, within the South Dartmoor SSSI. Description: The land is unfenced open moorland, within the South Dartmoor SSSI. It includes the land where the Swincombe and Strane rivers meet and runs north-east on both sides of the Swincombe, ending at the wall which runs north-west from Ter Hill. As well as the river, there are extensive areas of mire and grass moorland. There are the remains of tin workings and two leats. There are ten DPA boundary stones. In the 1930’s, South West Water acquired land from the Duchy in preparation for the building of the proposed Swincombe reservoir. 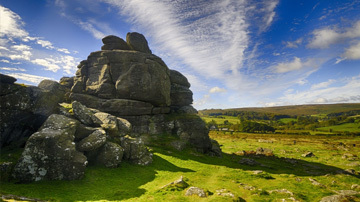 The land that SWW acquired came mostly from common land of the Forest of Dartmoor but also included land from the adjoining newtakes of Tor Royal and Fox Tor. The shape of the land parcel was predicated on the outline of the proposed reservoir. After the collapse of the Swincombe reservoir scheme, the DPA acquired a portion of the land from SWW in 1985. The land was purchased with funds provided from the Charity Settlement of Miss ML Trahair and a commemorative plaque records the circumstances of the purchase. We have now passed the 43rd anniversary of the saving of the Swincombe valley from what would have been a disastrous reservoir scheme. Opposition to the scheme was led by the DPA and objectors included Devon County Council and the Duchy of Cornwall. The Bill to bring about the scheme was eventually defeated after a lengthy consideration in Westminster. Read the full story of Swincombe on Kate Ashbrook’s website. Location: near Burrator, to the west of the moor. Close to Princetown-Yelverton road, B3212. Grid reference SX 559704. Area: 12.41 hectares (30 acres). Access: There is easy access from the B3212 and from Burrator and the neighbouring area. Description: The land is unfenced open moorland, and includes the summit of Sharpitor and surrounding area (a rough pentangle). There are five DPA boundary stones – one at each corner – as well as several lengths of reave and hut circles. The Sharpitor story for the DPA began during the last war, when an RAF station with a wooden-lattice mast was erected on the adjoining Peek Hill. As it was wartime there was no public inquiry: this was apparently a national defence requirement. In 1955 the Air Ministry sought planning approval to rebuild and enlarge the station as part of a chain of ‘Gee’ system (a radio-navigation system) stations. 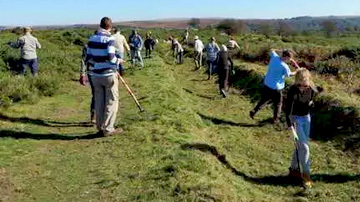 The Dartmoor National Park Committee and a number of amenity organisations objected to this. Permission was granted in 1956, but as a temporary measure, for ten years. And ten years later, the Air Ministry was told that the use must cease in another three. On 14 Mar 1969, the DPA’s chairman, Sylvia Sayer, reminded the Ministry of Defence that time was up: the building should be removed and the site cleared. The reply was that there was ‘still an operational requirement for the station until March 1970’. The DPA feared that the ministry intended to hand over the land to the BBC or some local television operator, thereby evading the cost of clearing the site. There were parliamentary questions. 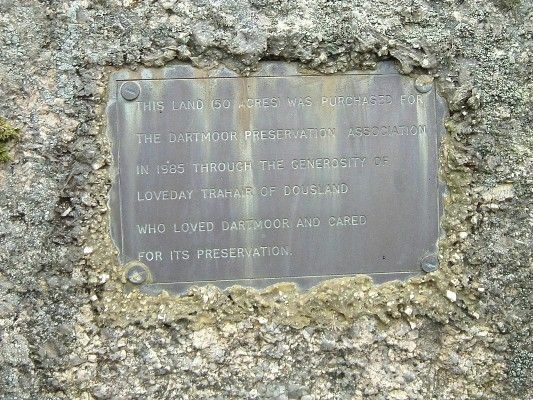 On 23 February 1970, the national park committee was suddenly faced with a proposal by Devon and Cornwall Police to take over the station and use the mast. This roused a storm at the meeting and fortunately the committee rejected the proposal. At last, in April 1970, the Ministry of Defence wrote to Sylvia that the station would be closed and the site cleared and restored. Yet, despite this assurance, nothing happened. Then suddenly, on 2 November 1970, there was a press statement that Plymouth Corporation intended to use the obsolete building as a training centre for ‘potential offenders among Plymouth’s juveniles’. The corporation owned the land and had priority rights. It seems inconceivable that anyone could contemplate housing young offenders on such a bleak site. In 1971, the national park authority urged Tavistock Rural District Council, the planning authority, to refuse permission, arguing that ‘the change of use…would perpetuate the buildings prominently sited in the national park, and constitute a further gross intrusion into the visual amenities of the area’. The council refused permission, but Plymouth appealed. Thus a public inquiry was held in June 1973 into the change of use ‘from RAF communications post to adventure centre at Sharpitor RAF post’, involving the refurbishment of four, single-storey buildings. 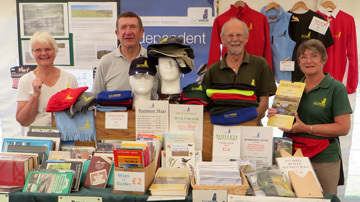 Sylvia Sayer represented the Council for National Parks, the Open Spaces Society and the DPA. She argued that the change of use would constitute an eyesore on such an exposed site, and that the climate was totally unsuitable for such a development. The inspector was Major-General AHG Dobson CB OBE MC BA, who had no planning qualifications (a fact which was not unnoticed by the objectors). However, despite this, he commendably rejected the application because the site was ‘unsuitable on climatic grounds’ and the buildings were ‘a most unfortunate intrusion into the countryside of the Dartmoor National Park, to which the public has access. The sense of remoteness which is the unique quality of the high areas of the moor is effectively destroyed by the presence of the buildings and other encumbrances’. A resounding victory for the DPA and other objectors. The buildings were removed and the land passed to South West Water. 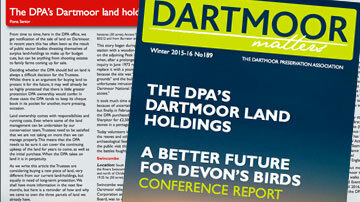 Shortly before the inquiry, Sylvia Sayer had retired as chairman of the DPA, becoming its patron, and the association established the Sylvia Sayer Land Fund, to purchase land in celebration of her superlative work for Dartmoor. A few years later the DPA successfully fought, side by side with South West Water, against renewed calls for a reservoir at Swincombe. On the strength of this friendship, Sylvia asked SWW if we could buy the land at Sharpitor, to mark our victory. It took much time and negotiation, not least because of uncertainties over a tenancy agreement, but finally, in February 1984, the DPA purchased 31.96 acres for £2,500 and we erected our boundary stones in a pentagon around the site. The land is not actually that on which the RAF station was sited, but it is close by and includes the magnificent rocky outcrops of Sharpitor itself. While few who visit this exhilarating height will be aware of its chequered history, it is good to know that it is safe for ever, thanks in no small part to the DPA’s persistence. 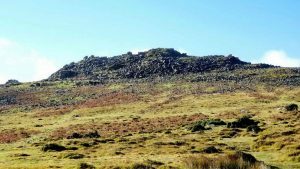 In spring 2016, the DPA completed its purchase of a small area of land on Dartmoor, the first new purchase for over 30 years. The land had been owned for about 20 years by Elizabeth Proctor and managed under an agreement with Dartmoor National Park Authority because of its importance as a traditional hay meadow. The DPA bought it, with the help of a generous legacy, to ensure its continued conservation. There are three fields and several small shelterbelt areas of Scots pine and deciduous shrubs and trees, centred on SX727743. The land lies either side of a farm track/bridleway running south from the road from Widecombe to Cold East Cross. We also own the bridleway. The total area is about 1.3 ha (3.2 acres). All the fields are valuable wildlife habitat and the land is a County Wildlife Site. Pudsham Meadow (the first field on the left near where the bridleway leaves Pudsham Down) is very species-rich and, according to Dartmoor National Park ecologists, it is one of the best hay meadows in the National Park. The other two fields had been abandoned in the past but with the help of the DNPA ecologists and others, and the support of the previous owner, they are rapidly improving. The UK Biodiversity Action Plan identifies such fields as Priority Habitat, due to its dramatic decline over the past half century; they are now highly localised and Dartmoor has about 6% of the national resource – few as good as Pudsham. With its diversity of wild flowers the meadows support abundant insects, including butterflies and bees – Small Pearl-Bordered Fritillaries have been seen nectaring. In June an orchid count by volunteers from Devon Wildlife Trust and the DPA found 742 Greater Butterfly-orchids, 1419 Heath Spotted-orchids, 1169 Southern Marsh-orchids, and 87 Twayblades. There is a regime of bracken cutting in late summer and short term pony grazing in late summer/autumn, to prevent colonisation by rank and invasive species. 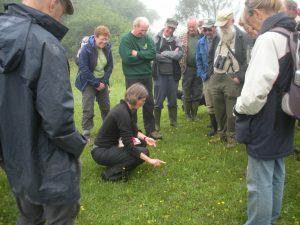 Ecologist Hilary Marshall is drawing up a management plan for the DPA to ensure that the sympathetic management that has been in place for the last decade or more is continued and the special qualities and rarities of the area are conserved. DPA members are welcome to visit the site, but please tread very carefully to avoid damaging the orchids and do not go into the fields if there are ponies present. There is limited parking on the verge where the bridlepath leaves Pudsham Down.